as well as featured by the religious broadcaster Day 1. Happy Easter everyone! I have to tell you, celebrating Easter always makes me think of my grandmother, Ganny, as we called her. Now Ganny lived in a tiny little town in South Carolina; and when we’d go visit, the aroma of all kinds of good things cooking would float through her screen porch and out into the yard to greet us: creamed corn, collard greens and hopefully cornbread. I say hopefully, because the one thing Ganny could not cook was biscuits. Lord, have mercy. She was just not a big believer in things like baking soda or baking powder. On those ominous days when she would decide to bake biscuits, she would open the door of her wood stove and pull out what looked like a tray of toasty hot shot-puts. My uncle used to joke that if you dropped those biscuits on the floor, they would wake the dead. Thus their nickname: resurrection biscuits. So…this being Easter Sunday, I think about Ganny, bless her heart, and those little sad resurrection biscuits. But, you know, I think her biscuits offer us an important Easter message. 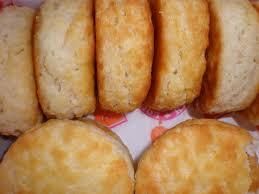 Without baking powder–without that key ingredient, those biscuits became heavy and flat. So, too, life without the resurrection, life without Christ, can be heavy and flat. We tend to think of the Easter message as a message for the end of life. But, frankly, I think we need the Easter message right now, ’cause as many of us know, death can come long before the end of life. It’s easy to celebrate the resurrection of the body on this glorious Easter Sunday. But what about the resurrection of the spirit? What about tomorrow morning, when the alarm clock goes off at 6 a.m. and our spirits sink…where is the resurrection then? Where is the resurrection when we work night and day in a thankless job and yet find ourselves deeper in debt? Where is the resurrection when our child gets caught in an ugly cycle of drugs and alcohol and we watch them slip away? Where is the resurrection when after working forty years we realize we’re about to lose our home? Where is the resurrection when we wake up one morning and realize nothing matters to us anymore? Where is the resurrection when at the end of life our family and friends are all gone and we are left alone to negotiate in a world that does not honor its old ones? WHERE is the resurrection then? It’s not just resurrection after death we’re talking about, it is resurrection during life. Like biscuits without baking powder, life without the resurrection can be heavy and flat. But, today, I say we bring that missing ingredient back. Just then, she turned around and Jesus was standing there. But she didn’t recognize him. And the second he says her name, Mary realizes that this stranger standing before her was the risen Christ. “Rabbouni” she says to Jesus. Mary recognized the living Christ. She recognized that life force in her midst. And it’s exactly the same for us. We have the risen Christ right in front of us. We have a life force in our midst. And that’s the missing ingredient we must reclaim. In February 2005, I took a vacation to Death Valley. Okay, I know, I know, that is a really strange place to vacation. But something was happening in that desert during that time, something I felt I needed to see. Earlier that year, Death Valley had received a few more inches of rain than normal and the otherwise bleak sand dunes and rocks of the desert were covered with tiny wildflowers. Desert gold, blazing star, poppies, verbenas, and evening primrose blanketed the desert landscape. For years, those little seeds had remained dormant, hidden under rocks and sand, in cracks and crevasses, waiting, hoping, for rain–that missing ingredient–to bring them back to life. And the rain came. And flowers bloomed in the desert. It was such a brilliant symbol of renewal–of life from no life. I just needed to see it. Like those little dormant seeds, there is still life in us all. We just need to find that missing ingredient to bring it back. And that ingredient is Jesus. The Saturday before my very first Easter sermon, I was walking around my neighborhood trying to walk off some nerves. Towards the end of my walk, I stopped by the local deli to get some coffee. I’ve never forgotten those words, for they are not only great advice for a sermon, they are great advice for life. Another great truth in life is this: Deep down, the human spirit yearns for joy, yearns to soar. Kind of like my nieces’ favorite movie Mary Poppins, a movie they made me watch over and over and over when they were little. Bless their hearts. Even after watching it 700 times, I still love the scene where Uncle Albert starts laughing in that lifeless, sterile bank vault. As he laughed with joy, he began to float up to the ceiling. The laughter and life and passion he felt brought him a lightness that made him float. And everyone around him began to laugh and float up as well. That scene taps a deep human truth: that we all have a spirit that yearns for joy and lightness–a spirit that yearns to soar. And then life gets in the way–key ingredients go missing–and over time our spirits sink and become flat and heavy and bleak. …so that our spirits are not mired in a tomb. Easter brings each of us a second chance. A chance to see the life force in our midst. A chance to recognize the risen Christ right in front of us. A chance to start again.